Sony’s SRS-X9 is a tour de force of elegant style and high-performance sound, but it will cost you. Once king of consumer electronics, Sony has slipped in the rankings over the last decade, especially when it comes to audio gear. However, in an attempt to rebrand itself, Sony seems to have thrown out its aging playbook. The struggling colossus has put its full weight behind the proliferation of hi-res audio across its product line, from content to hardware, and wireless speakers are no exception. 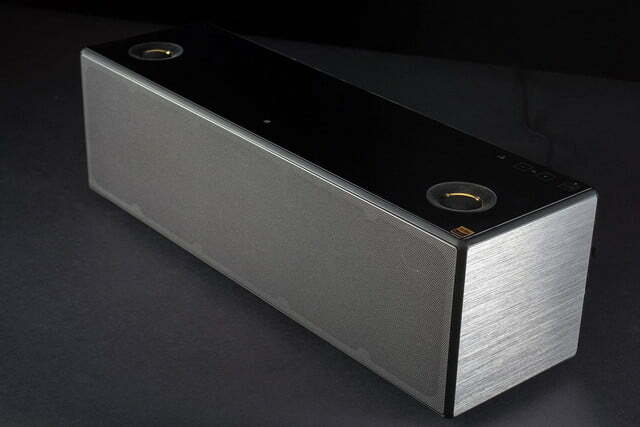 There’s perhaps no better expression of Sony’s recent pivot towards premium sound than the SRS-X9 wireless speaker. The patriarch of Sony’s new wireless speaker family, the X9 is elegant, powerful, and packed with features, including both Bluetooth and Wi-Fi connectivity. And although it begs a kingly price of almost $700 (yeah, we know), the X9 is resounding proof that Sony still knows how to kick out an excellent piece of high-end audio gear. Pulling the X9 from its cardboard habitat, it was immediately clear that this speaker is a heavy hitter – and we mean that quite literally. Carved into a solid brick of glass, metal, and robust resin, it’s anything but flimsy. In fact, the X9 is so solid that it feels like it’s packed with lead shot. Putting it in place is a two-handed affair for sure. 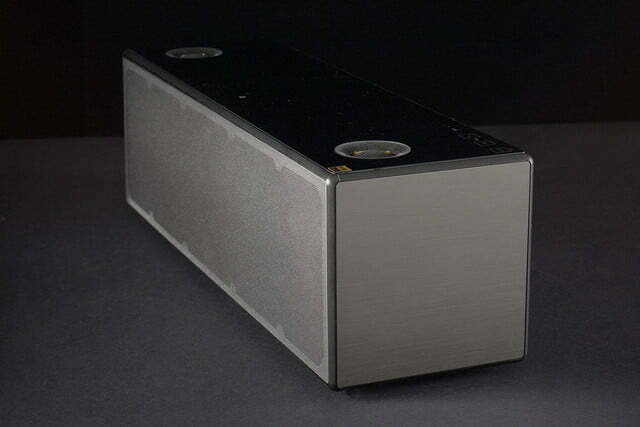 The speaker is so solid that it feels like it’s loaded with lead shot. From the onset, there was no doubt the X9 belongs to the SRS-X family, borrowing the same “neutral” design theme we saw in the mid-tier model, the X7. 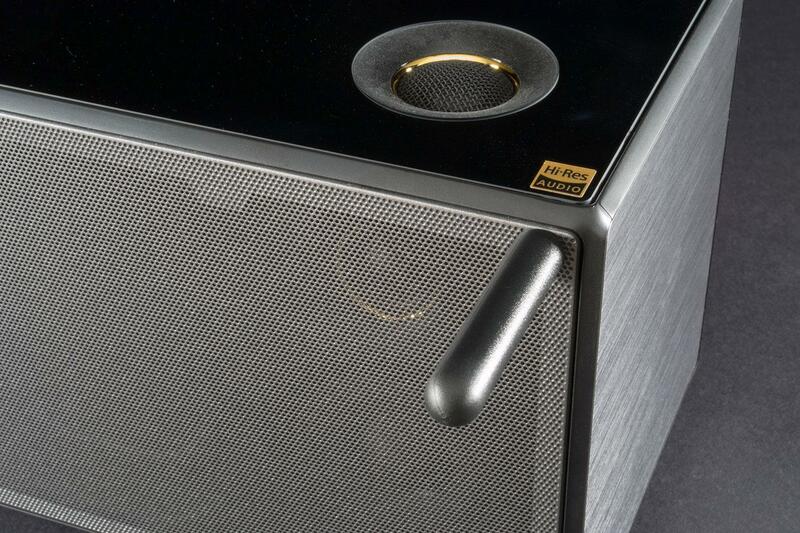 Still, little extras such as a sunken pair of up-firing “super tweeters” ringed in gold, a brushed aluminum siding, and a magnetically-affixed speaker screen underscore the speaker’s more regal bearing. Inside the box we discovered a healthy collection of accessories, including a slim remote, two AAA batteries, a polishing cloth, and pair of small tools with magnets at their tips, cleverly designed for popping off the speaker’s slim metallic grill. While we were a little bored at first by Sony’s repetitious design theme (which expands beyond the SRS-X lineup to products like the company’s XT1 sound base) the X9 quickly won us over with its more luxurious aesthetic. 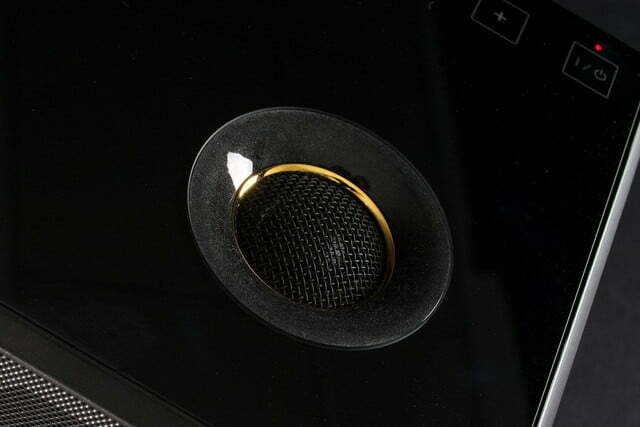 The premium vibe extends from the speaker’s excellent build quality and sleek look, to its minimalist form and function. 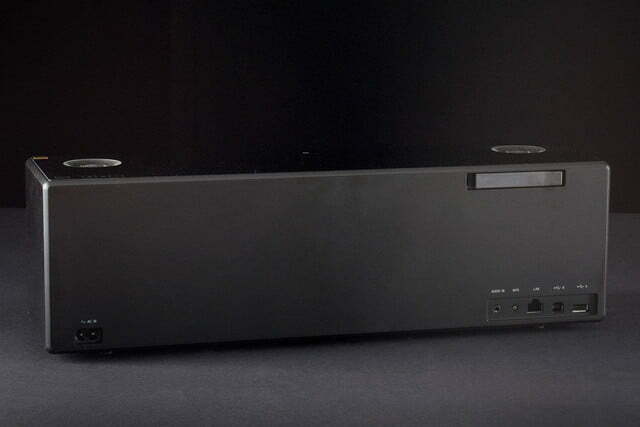 One of the aspects we enjoyed most was the elegant array of touch-capacitive control keys along the top panel. 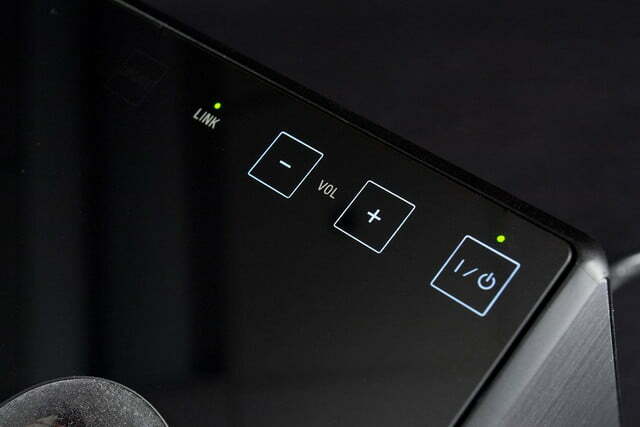 Primary keys for power and volume are always in view, but powering the unit on illuminates another row of controls for source selection and Bluetooth pairing. Just for fun, the keys light up from their darkened state with a wave of the hand – a feature we enjoyed more than expected. 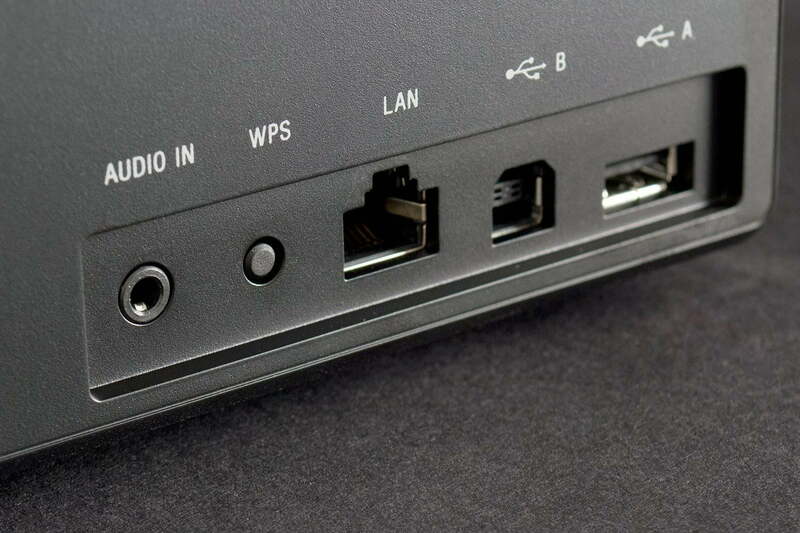 At the back of the device is an input panel with an Ethernet port, USB-A and USB-B inputs, a WPS key, and a 3.5mm Aux input. Also at the back is a retractable antenna for extending Wi-Fi range. Wireless connectivity includes NFC pairing, Bluetooth 3.0 with aptX for CD-quality sound from compatible devices, as well as Wi-Fi with Airplay and DLNA support. Staying true to its hi-res claims, the X9 is compatible with a host of file types, from MP3s to WAV, DSD and FLAC files, with a max resolution of a whopping 192kHz/24 bit. 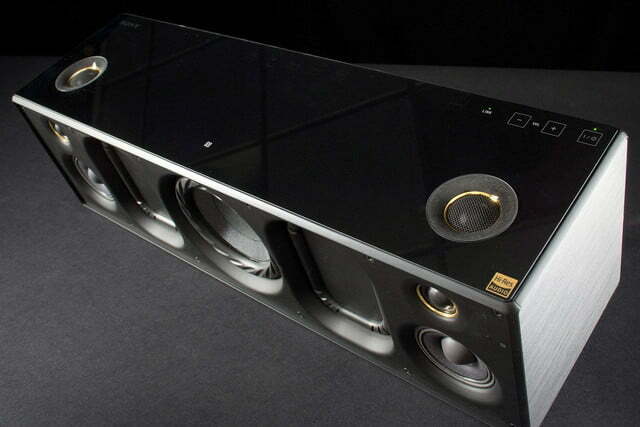 By the numbers, the speaker is approximately 17-inches across, 5-inches deep, and 5-inches high. The total weight is 10.4 pounds. 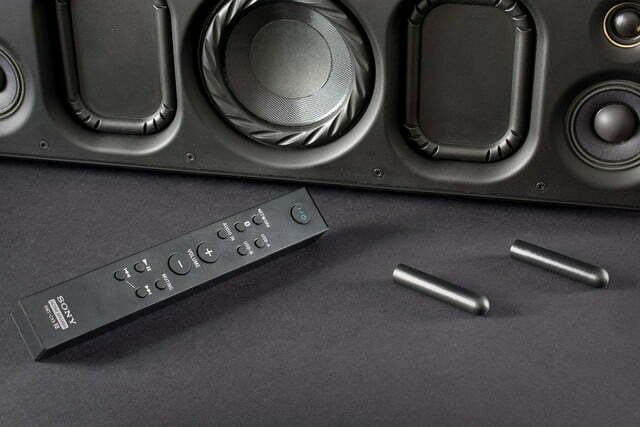 If you use the cool magnetic grill removal tools to pop off the X9’s speaker screen, you’ll find an array of drivers, including twin ¾-inch supertweeters, a pair of 2-inch midrange drivers, and a 3 ¾-inch woofer, flanked by passive radiators to aid reproduction of the low frequencies. Adding in the topside supertweeters, the X9 hosts seven active drivers in total. 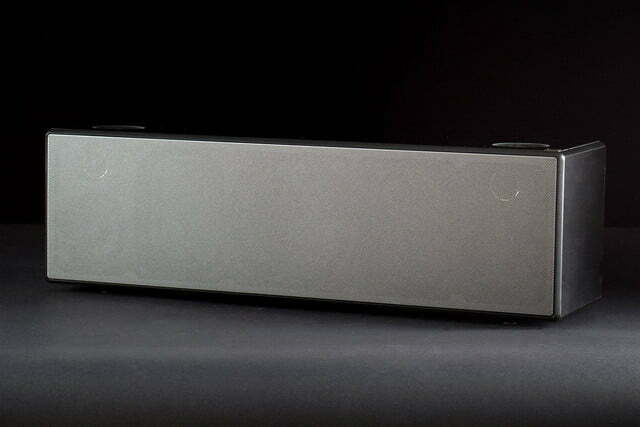 The system is powered by 8 digital amplifiers pushing a claimed 154 watts total, and runs through Sony’s proprietary DSP with its well-designed ClearAudio+ voicing. Bluetooth is the easiest way to play, and it sounds great, especially for basic MP3 playback. Pairing was as simple as tapping the pairing button, and choosing the device from our iPhone. Once we’d paired via Bluetooth, the X9 was also extremely easy to connect to Wi-Fi. 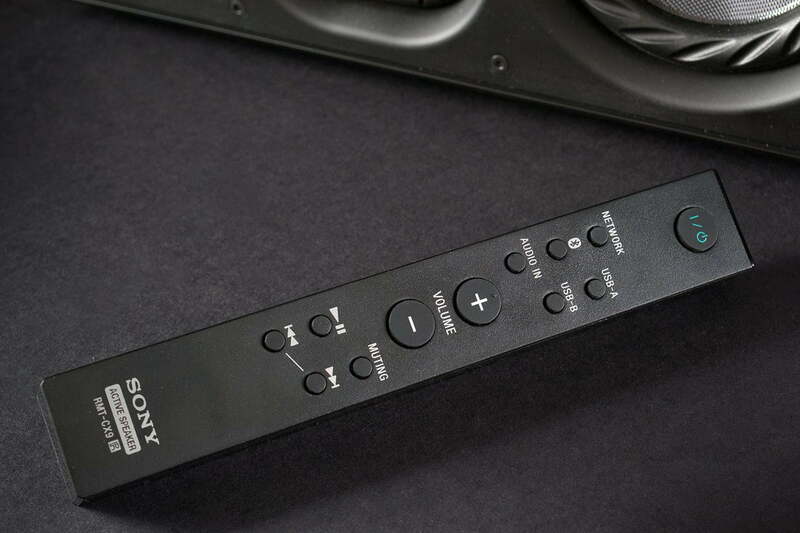 After downloading Sony’s Songpal app, we simply followed the instructions which easily found the device, prompted us to click ‘allow’ for sharing our phone’s Wi-Fi settings, and we were quickly hooked up to connect our iPhone 5 via Airplay. Users loading new hi-res files into iTunes will also want to make sure preferences aren’t set to down-convert the files – we set ours to convert to full-sized WAVs as we only had a few to add. Check out DT’s music section for a list of hi-res file sites if you’re looking to get on board. If you want to keep the files in their native format (and you should) but still want to stream via computer, consider a player like JRiver and stream via DLNA. 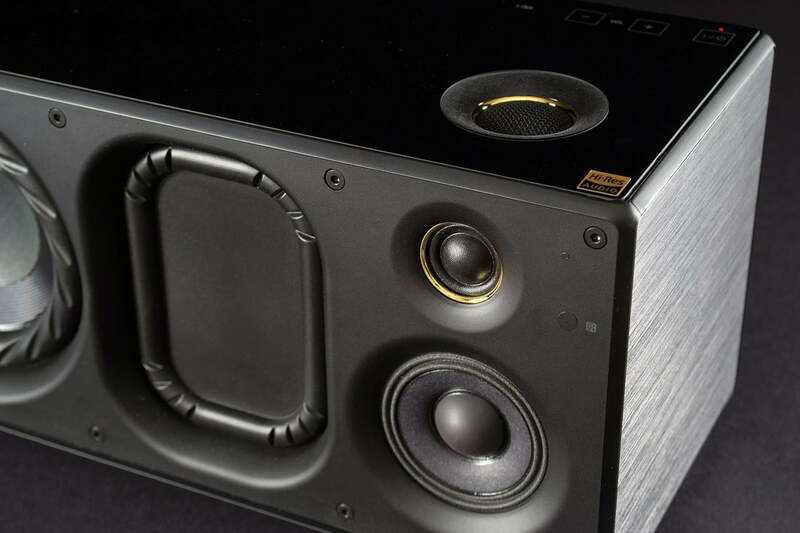 The SRS-X9 is capable of pulling off an absolutely gorgeous sonic performance, transcending beyond the normal wireless-speaker fare into a listening experience worthy of a persnickety audiophile. Though there is no doubt its ultra clean sound signature shines a bit too brightly at times, the X9 offers the kind of clarity, definition, and lucid detail that lends itself to devoted listening sessions. The X9’s clarity and forward presence rewarded us with a refined, multicolored palette of sounds. In our evaluation, the X9’s talents translated into textural strokes of a pick across acoustic guitar strings, fluid runs of classical violin solos that pulled us along like a roller coaster ride, and vividly separated bursts from cymbals that hung in the air and blossomed into smooth, powdery resonance. In addition, the super tweeters atop the unit seemed to add some visceral dimension, both side to side, and front to back, making the speaker sound bigger than its compact size would suggest. 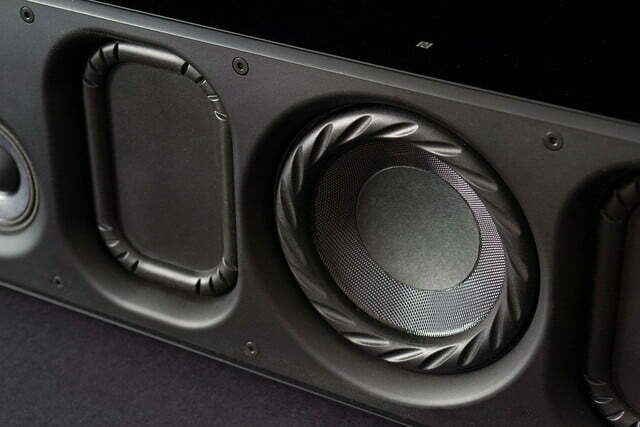 One of the most impactful results of the X9’s brazen clarity was its handling of vocal lines. Our hi-res (96kHz/24bit) version of Tori Amos’ “Trouble Lament” ushered forth her sweet, melancholy vocal tone with an almost live presence. But it wasn’t just hi-res tracks that brought the heat. 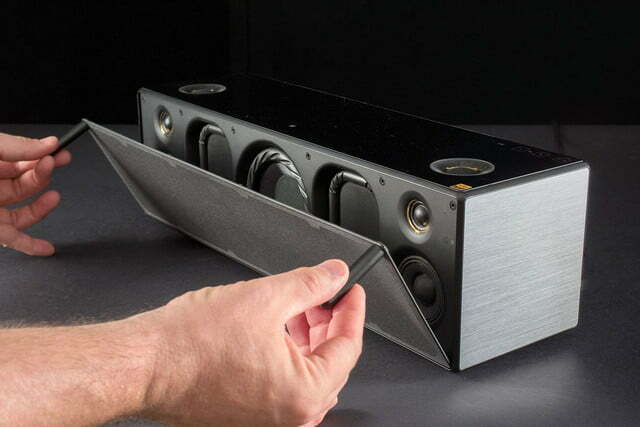 The speaker unveiled a talented hand for well-produced MP3s, cutting stark separation between instruments, and letting vocal lines float above the fray with luminous expanse, and long trails of misty reverb. When it comes to bass, it’s likely no surprise that this speaker isn’t built to pump up the hip-hop jams at a block party, or knock over your cocktail when BIG’s “Hypnotize” rumbles through. Still, it held its own with a respectable dive below the 80Hz line, and did so with a firm, musical punch. Those radiators helped dig out some heavy resonance for toms, kick drum, and bass guitar, adding just enough foundation for a full-rounded sound. 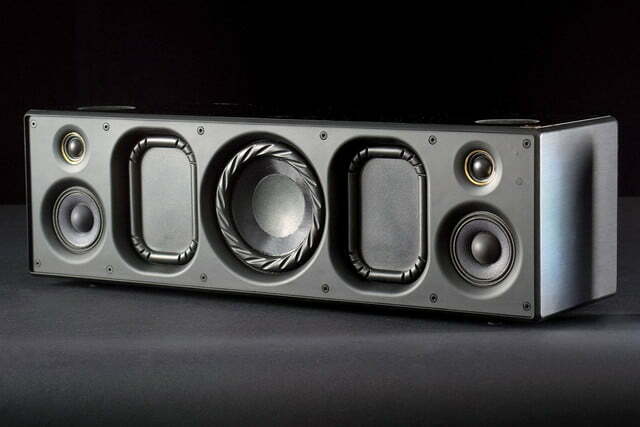 Of course, the speaker isn’t without its flaws: at times that snappy color to the sound became a tad overbearing. An interesting example of the speaker’s pros and cons across the frequency spectrum came from back-to-back tracks off Muse’s Resistance album. “Map of the Problematique” was by no means offensive, but the lead vocal got too spicy at the consonances, and the percussion was also a little sharp for our taste, with snares pulled so tightly they almost had the short clip of rim shots. Yet, as the album moved on to “Soldier’s Poem,” the X9’s clarity and forward presence rewarded us with a refined, multicolored palette of sounds, particularly evident in the heavy brushwork that scraped the snare head, etching out airy waves of sound that felt almost as though they were shifting right across our ears. 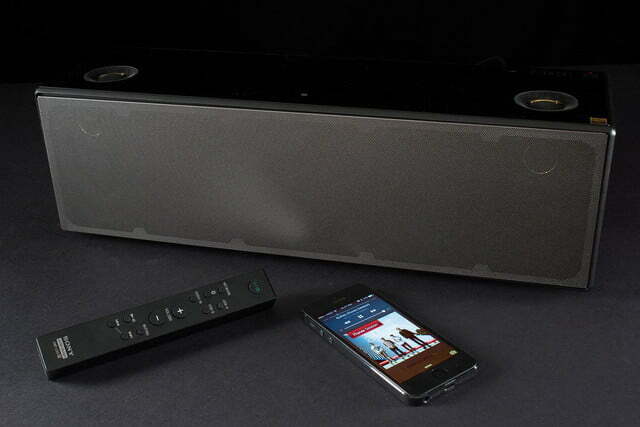 Sony’s SRS-X9 wireless speaker is a tour de force of elegant style and high-performance sound, but it will cost you. Still, for those who can handle the sticker shock and a sound signature as bright as the morning dawn, this speaker is teeming with moments of brilliant detail and sonic refinement that make it well worth the ride.